We will be performing a joint concert with our neighbouring choir, Churchdown MVC, who have recently celebrated their 50th Anniversary. The concert will be held in St. Andrew’s Church, Churchdown, Gloucester on Saturday 27th April at 7:30 pm. Proceeds will go to Guide Dogs for the Blind. We plan to perform the following public concerts in 2019. We hope to see you at one or more of them. This concert is part of a short tour by the Choir. 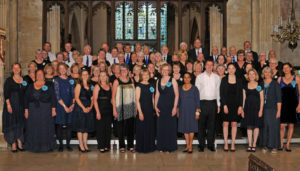 Formed in 1983 it has sung over 500 Concerts and raised over £400,000 for charity, performing in varied locations including Westminster Hall, The Albert Hall, The Cutty Sark in Greenwich, Belvoir Castle, village halls, 20 different cathedrals and churches. Internationally, the choir has also performed in Belgium, Germany, Italy, France and Wales. Impressive! Once again, we are delighted to be joined by Erin Hughes. Since leaving Cirencester, the Siddington-born soprano has been touring the world as a professional opera singer and singing in locations as diverse as Mexico City and Bologna in Italy. 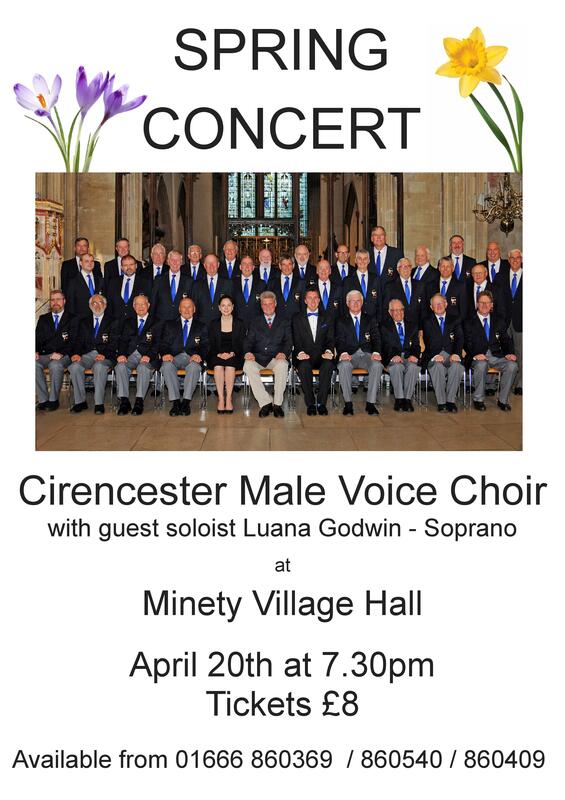 The concert takes place at Cirencester Baptist Church at 7:30 pm on Saturday 6th April. We will be raising funds for Hope for Tomorrow – a Tetbury-based charity which brings cancer care closer to patients’ homes via Mobile Cancer Care Units (MCCUs). Saturday, 27th April – Joint Concert with Churchdown Male Voice Choir. We have been invited to perform with our neighbouring choir, Churchdown MVC, who have recently celebrated their 50th Anniversary. Over the years, the choir has shared the stage with many great singers and performers. We are told that concert guests have included; Sir Tom Jones, Dame Shirley Bassey, Sir Cliff Richard, Dennis O’Neill, Max Boyce, Elaine Paige, Michael Dennison, and Honor Blackman. The concert will be held in St, Andrew’s Church, Churchdown, Gloucester on Saturday 27th April at 7:30 pm. Proceeds will go to Guide Dogs for the Blind. The “Sand Mates” were formed in 1915 and have built a considerable musical reputation in their home country, Norway. Their previous tours have encompassed Ireland, Prague, Riga (Lithuania), Gdansk (Poland) and Liverpool. Local mezzo soprano Alice Nelson, who has made multiple concert platform appearances throughout the UK, will be joining us for the concert. We will be performing in Cirencester Parish Church at 7.30 pm. 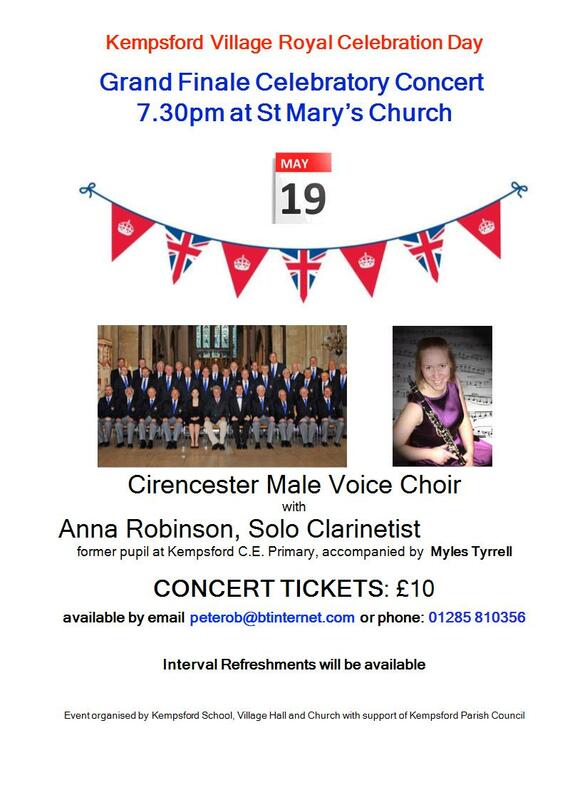 We will be hosting a celebratory musical evening in the Parish Church, Cirencester, to mark our 10th Anniversary. Further details to be announced, but keep the date in your diary! The Band established itself as part of Cirencester’s musical heritage in 1919. For the past 18 years it has brought together local music talent to entertain and raise funds for local charities. This year, we are proud to have been invited to join in the proceedings. Come along to hear us at 7.30 pm in Cirencester Parish Church. CMVC are proud to announce our 10th Anniversary CDs are now available. They feature a selection of music from across our first 10 years are are available to purchase below. 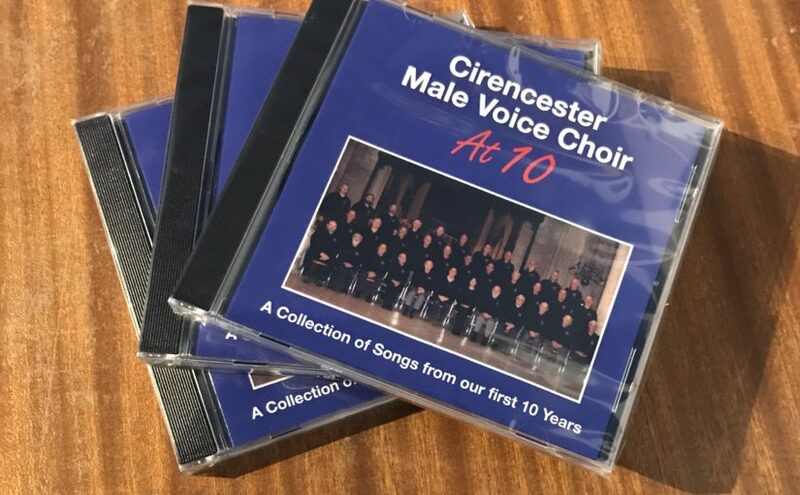 You will need to send your CD code along with your delivery address to CD@cirencestermvc.co.uk to have your CDs dispatched. We’ll be raising money for Macmillan Cancer Support this Friday at Tesco Extra, Kings Meadow, singing from 6 to 7pm. Do come by – as you know, every little helps! If you can’t make that, we’ll be at the Golden Farm, Upper Churnside, between approximately 7:30 and 8:30pm. PS We raised almost £300 – thank you everyone. We were delighted to take part again in Maria Jagusz’s annual showpiece for her talented up and coming performers. We were joined by three excellent local choirs on Saturday 15th December for a winter-themed concert. Together with the Cirencester Community Choir, Cirencester Singers, and Corinium Community Choir we presented a wide-ranging programme which was thoroughly enjoyed by a large audience. The concert was in aid of the Sue Ryder Leckhampton Court Hospice and raised a total of £1500 for the charity. Our thanks go to all who contributed so generously. 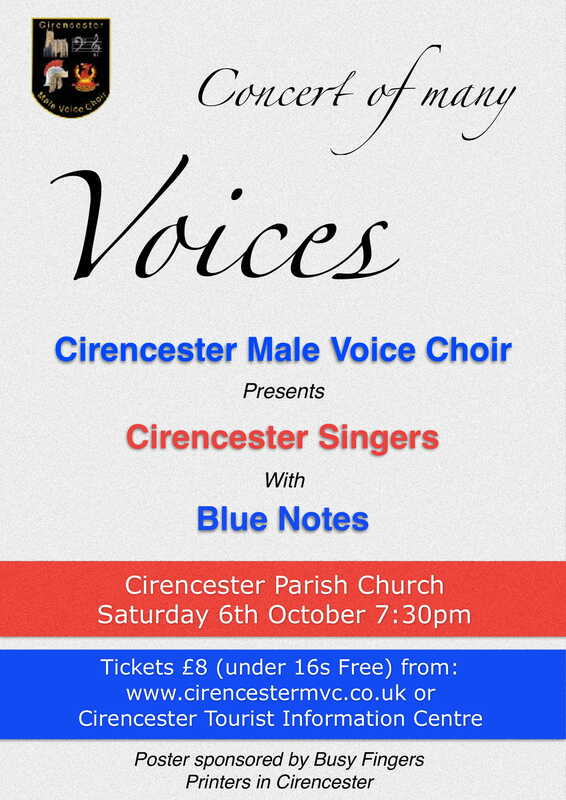 We were delighted to host Cirencester Singers and Blue Notes in a ‘Concert of Many Voices’ in Cirencester Parish Church on the first Saturday of October. Cirencester Male Voice Choir hosted another highly enjoyable golf day at Cirencester Golf Club on 5th October 2018. The weather was great, the course and food were excellent, and Lorraine joined us to present the prizes. The winning team was ‘All 4 Par, & Par 4 All’ and the John Batty Memorial Trophy for the highest scoring Choir member went to Hugh Browne. Our thanks to all who supported the day with sponsorship, prizes and organisation. And of course to those who got teams together and found players – the day just wouldn’t happen without you. Undoubtably a highlight of the year so far was a trip to Cornwall, where we performed two concerts, in Truro on June 22nd and in Breage on June 23rd as part of their festival. Each was shared with groups of the Cornwall Community Choir under ex-Cirencester choirmaster Neil Shepherd. The afterglow in Breage was also excellent, thanks in no small part to Jules’ new whistle and Lorraine’s applaudissements (Fr.). And we sang ‘Nothing like a Dame’ under real mangoes and bananas at the Eden project. 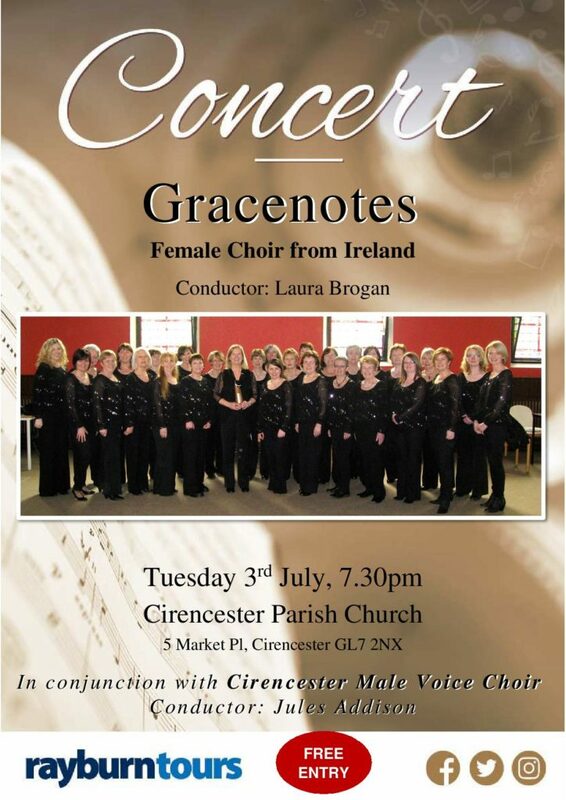 We were delighted to take part in a joint concert at Cirencester Parish Church supporting Gracenotes, an impressive Irish female-voice choir who performed a varied repertoire, a cappella, including spirituals and folk music as well as early and contemporary works. To mark the royal wedding of Harry and Meghan on May 19th 2018, Kempsford held a Celebratory Concert, featuring our Choir and clarinettist Anna Robinson. Minety Village Hall was the venue for a concert on April 20th 2018 also featuring soprano Luana Godwin. Our first performance of’ ‘Fields of Athenry’, as arranged by Joy Amman Davies, was promising if not exemplary. Cirencester MVC joined forces with Cotswold MVC and the sparkling Blue Notes ladies choir for a musical evening in aid of the Cirencester Hospital League of Friends and the Friends of Paternoster School. Acoustics in the new Baptist Church were good, our new keyboard and sound system passed the test, and we certainly held our own music-wise. However we were out-sung by Cotswold in an enjoyable afterglow, we must work on this. 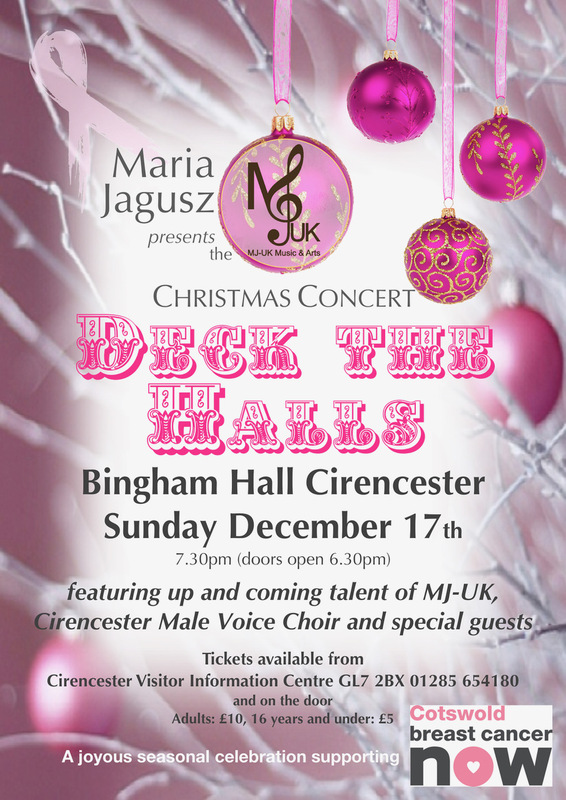 17th December we joined the MJ-UK Christmas Concert in support of Cotswold Breast Cancer Trust, at Bingham Hall. Maria Jugaszs’s young performers were a delight to watch and hear, and ‘Bring Him Home’ has seldom sounded better. We raised over £250 with Carols at Tesco, going towards the very deserving Longfield Hospice Care for the Cotswolds. And finally, wine and mince pies were the order of the day after some spirited singing at Paternoster and Watermoor Care Homes. The town Christmas lights were switched on on December 2nd in front of a huge crowd in the main square. 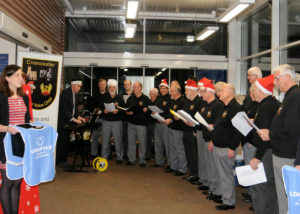 We did our best to inspire them with carols and a ‘Song for Cirencester’ but would have benefited from amplification. Next we took part in Cirencester Christmas Spectacular in the Parish Church on December 6th. The lighting and sound effects were amazing, as reportedly were our choir. 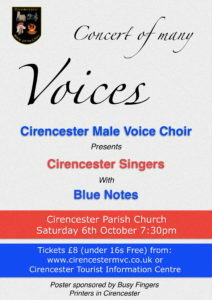 Cirencester Male Voice Choir joined with Penistone Ladies Choir, all the way from Yorkshire, and Blue Notes, from South Cerney, for a fantastic programme of music of different styles and genres. The evening culminated in a joint number of the Righteous Brothers hit “Unchained Melody” sung in a complicated arrangement between all three choirs. The concert was the first with CMVC for our new accompanist, Lorraine Wild, who also enjoyed her conducting debut when Jules left to accompany on the organ. The evening was in aid of the children’s rugby charity, Wooden Spoon, who help to positively transform the lives of children and young people with a disability or facing disadvantage across the UK and Ireland through the power of rugby.